Update to the latest version of ORFs in your research! Are you aware even same accession of one ORF has different versions? Are you aware whether you are using the right version in you experiment? Are you aware wrong version of ORFs might result in non-functional proteins? Search for the latest version of your ORFs at GenScript now! 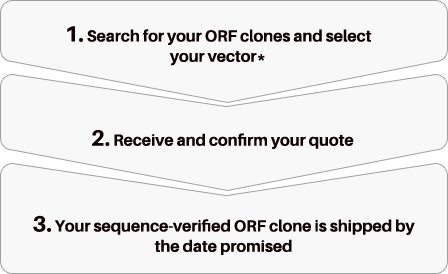 Why choose GenEZ™ ORF clones? * Some vectors may need to be shipped by the customer to GenScript. © 2002-2019 GenScript All rights reserved.